I spent some time this week going through my book wishlist, requesting them from the library in a new surge of conviction that THIS TIME I won’t just eat the very same cost of the books in library fines as I would if I had bought them. But since that still leaves me with the need for e-books on my phone to fall asleep on, I bought a couple of new books. Lately my book recs have come from particular blogging friends (oursin, wiredferret, seelight) and my friend Bryony in England (though I am ignoring her obsession with Icelandic mystery and action novels). 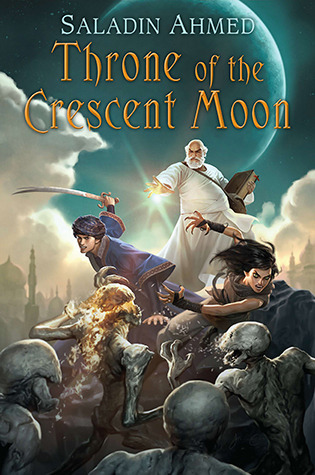 And tonight in the bath I was reading the book I bought, Throne of the Crescent Moon, by Saladin Ahmed. For a while it felt a bit stumbly and awkward, but lovely anyway. It was easy to let go of whatever hangups bugged me about the writing style and see where the book and its charming characters were going. The lion-girl was a good sign! Sometimes I wait while reading for myself to open up to the experience or the ride and have to let go of… of something. (That’s an important feeling, hard to convey, which people may describe as taking a while to get into, but which I think is often a lack of context on the reader’s part. ) Without practicing that letting-go, omg, the things I would have missed in so many excellent books! And details obviously references someone would make sense of were slipping by, that I knew I was missing,. Rughali = ghali = egyptian? Where is the Soo Republic – Soo = Somalia? Missing it all over the place. Tantalizing! Someone else will get it right off and like it. Good. Anyway, as I was in mid-story in Throne of the Crescent Moon, there was a moment where the book completely charmed me and I trusted the story. That’s what I want to describe! Upon waking a few hours later, Litaz made more tea and Adoulla thanked her for it as if she had saved his mother’s life. He was a bit less inconsolable after his rest, grim planning clearly giving him purpose. “That jackal-thing that calls itself Mouw Awa, and its mysterious ‘blessed friend’—they must be stopped. Somewhere out there is a ghulmaker more powerful than any I’ve ever faced. I fear for our city,” Adoulla said. He took a long, messy slurp of tea and wiped the excess from his beard. Your city, my friend, not ours, some resentful part of her protested. She’d lived in and loved Dhamsawaat for decades now, but the older she grew the more she pined to return to the Soo Republic. This city had given her meaningful work and more exciting experiences than she could count. But it was in this dirty city that her child had died. It was in this too-crowded city that her husband had grown older than his years. She did not want to die saving this place — not without having seen home again. That was great! And so rare! Here we are in a fantasy novel and someone has thought subtly of her own feelings and motivations. The city Adoullah loves is, to Litaz, also the (exciting, cool, but…) dirty city where her child died. We are treated to a person who helps her friend loyally and is about to be heroic, though she has mixed feelings about it all, and doesn’t see the situation the way he does or the way her husband does. The “of course”, thrown in offhand, on how she didn’t speak up to discuss this, was nicely done. She doesn’t behave in an out of place woman-fighting-patriarchy way (as so many annoying perky princesses unfortunately and pluckily and fakely do) and she is in control of her situation. And suddenly all the characters seemed to bloom as different from each other and as people, on their own tracks, rather than little representations of “people” who (as if their labor of existence were ultimately exploited by a capitalist machine) serve either the story or the Hero. I hope this conveys something of what charmed me. And I wish that charm wasn’t so rare. Now to read on. I hope Litaz doesn’t die saving the city, and gets to go back to the Soo Republic and have a nice life being the best alkhemist ever. It was a nice day but a tiring day; I had a very annoying bus driver and was filled with rage and sadness and confusion on the way to work (about which more later); I put it behind me, I worked hard, had a really nice lunch with co-workers, worked more, rode the bus home while working some more, thought fondly of my friends, made dinner for Oblomovka’s daughter (he is in Hong Kong for the circumvention conference), saw her and Taren off to the Exploratorium, listened to all the Perfume Genius songs twice indulging in a sort of luxurious solitary melancholy (instead of reading aloud and responsibly telling a small human to brush her teeth and put her pajamas on and get in bed twentyeleventy times), and read my friend Gina’s book draft (the Perfume Genius songs were in honor of her book, to go with it). I look forward extremely to reading more and the later versions. Step 1. File a bug! Step 3. Now you are ready to write some new features and stuff! Fly and be free! I always thought that was interesting because it is an attempt to reassure people that you don’t have to leap into immediate coding. Just file a bug, that is the first step. This results in people coming into projects and wondering vaguely how to find bugs. Part of what I want to do as bugmaster for Mozilla is to put in another step — look at the bugs already reported, since there are a squizillion of them, and see what you can do to improve the meta information of those bugs. Step 1. Find some feature that could use testing. Step 2. Figure out how to use it regularly. Step 4. Encounter behavior you think is a bug. There is a lot of background knowledge necessary to actually file a bug in the complicated system that is bugzilla.mozilla.org (or BMO). So let’s take the WebRTC example. Say you’ve followed Jason’s advice, used conversat.io for a while, and found A BUG. Jason helpfully provides a link directly into Bugzilla to the enter_bug form, with the Product and Component pre-filled out to be for a bug with WebRTC (the component) and Core (the product.) Bugs in BMO are categorized according to Product, like Firefox Desktop, Firefox for Android, FirefoxOS, Thunderbird, etc. “Core” is the product for the code that is shared between many other products. If you were looking to file a bug with WebRTC from scratch you would probably not know which product to file it under, though you have to choose one. So it’s great that Jason gives a link to the right product and component! But wait. There is so much more background, or context, to understand. You don’t have to, but it is very good to understand it! First of all you have to have a bugzilla account for the link to work properly. 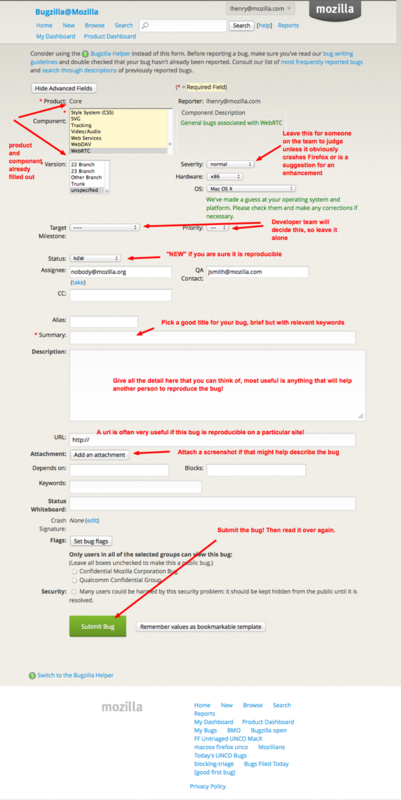 If you do that, you will be a new bugzilla user, and some of the bug entry forms will look different to you — you’ll be automatically directed to a “guided bug entry form” which is broken into several steps, rather than the form that shows you the whole “advanced view” with several dozen fields and dropdown menus. Second, how about looking at the list of all the components in the Core product. This is a good part of the background knowledge – a little piece of the map or geography of Bugzilla. As you can see, there are a lot of components that are part of Core. Scrolling down to the WebRTC bit, you can see that there are several sub categories: WebRTC, WebRTC:Audio/Video, WebRTC:Networking, and WebRTC:Signaling. Click on the general WebRTC component to see a list of open WebRTC bugs. This is where your geography lesson gets useful. Right now there are 113 open bugs for WebRTC. You might look over them simply to get an idea of what kinds of bugs others have found. More about this later! The important thing at this moment is: Is your bug already reported? Depending on how many bugs there are in this list, and your levels of interest and patience, you might want to either quickly read through the summaries (the title of the bug) or do a search down the page for words that might be in the bug you’re about to file. If you find something in that list that you think is your bug, take a closer look at it. Read it and the comments and try to understand what they’re talking about. If it is the same as your bug, you may want to leave a comment describing what you saw happen. After you enter a summary you will see a list pop up underneath the summary field, of bugs that may be similar. 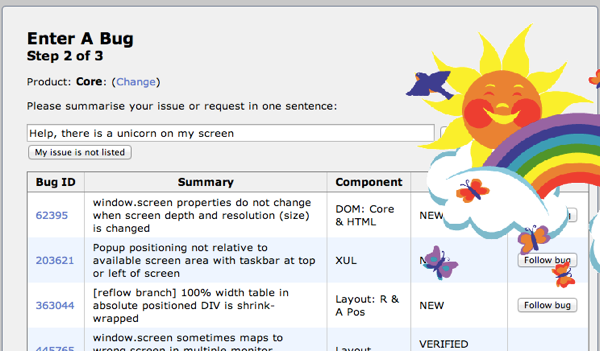 It is worth reading through those to see if anyone else has reported unicorns invading their conversat.io screens in Firefox. In this case, definitely not. Since no one else has reported this bug, I click the “My issue is not listed” button, and advance to screen 3, which suggests how I can describe my actions or steps to reproduce the issue, exactly what happened that I think is a bug, and what I think should have happened instead. 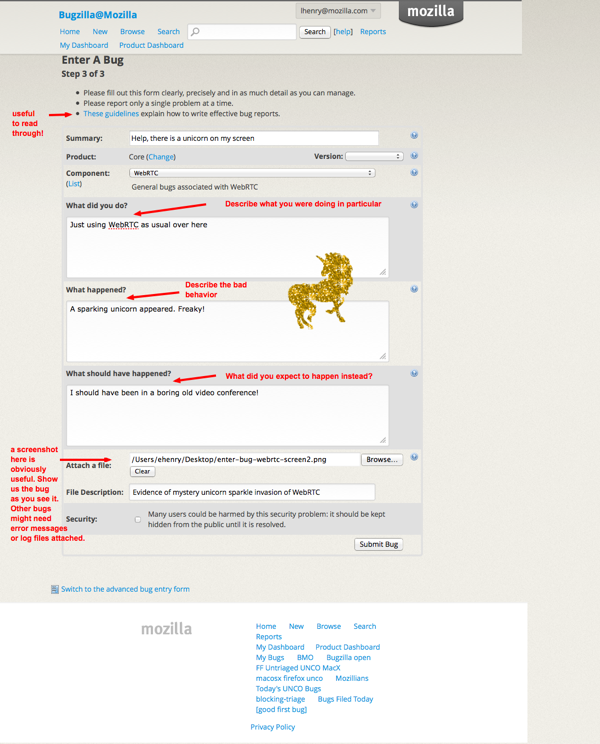 Step 4.5 Make a bugzilla.mozilla.org account. Step 4.6 Confirm it with the email confirmation. Step 4.7 Log in to bugzilla.mozilla.org. But wait, there’s more — or there can be if you want to get your bearings on that map of Bugzilla. Take a look back at the list of all the general open WebRTC bugs. What can we understand from this list? As I look over the current list it is pretty mysterious. From the language in the summaries, I would guess some of the bugs are notes by the development team for their own to-do list, and some of them look like bugs discovered by general users of the software. My first impulse is to sort the page a few different ways to see what that reveals. Sorting by Status shows the UNCONFIRMED bugs at the top and the NEW bugs listed just underneath. There is one titled getUserMedia freeze all system that isn’t confirmed yet and may be a good example. Here is an interesting one, No event when remote peer disappeared. My view of this bug is going to be different from yours, if you are new to Bugzilla, because I have more magic powers, ie, canconfirm and editbugs permissions, as well as some extra admin stuff. There is a lot of stuff on the page. It’s extremely “busy” with text! You have to learn to skim it and parse it mentally so that you can see and notice the stuff that is important to you at the moment. Here is what this bug looks like for a new Bugzilla user. What I can see from reading this bug is that there is at least one person actively looking at newly filed bugs, triaging them, and working on the project. And in fact as I click around and read more of the bugs for WebRTC I can see Jason is actively engaged with most of them, which is not a big surprise since he is blogging about the subject. Jason’s blog looks like a quite useful place to find out areas that welcome testers and bug-finders. You can also look at the QMO quality assurance and testing pages which explain how to run nightly builds and participate in QA’s bug test and triage days. My bigger point here, though, is that to start contributing to an open source project, aside from reporting one-off bugs you accidentally discover, it is super helpful to learn the landscape of the project. Adopt the project and poke around to learn about it. 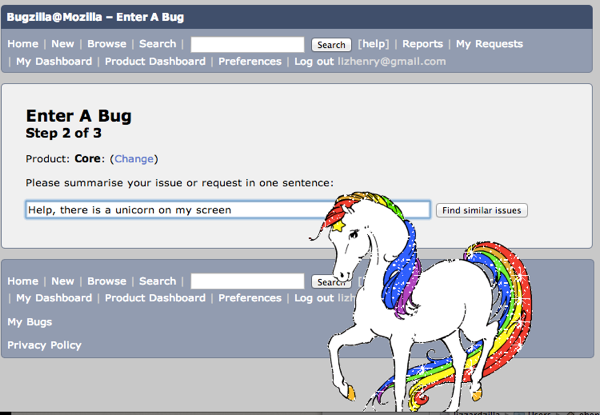 If you are reporting a bug, look at the other bugs. Look at who is commenting and working on those bugs. Join their IRC channel and read their wiki pages and (usually more formal than the wiki pages…) developer documentation. Or simply google the project to learn more about what’s going on with it. In this case I found that conversat.io is quite new and was developed partly to show off what WebRTC is and what it can do. 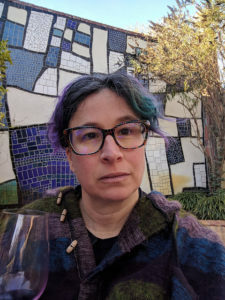 It was really apparent, from my morning of poking around, how much transparency there is at Mozilla, and the amazing technical depths you can get to from half a day’s reading and bug surfing. As a society we really have yet to realize the implications for education and educational institutions. It is a major cultural shift I am happy to be part of.